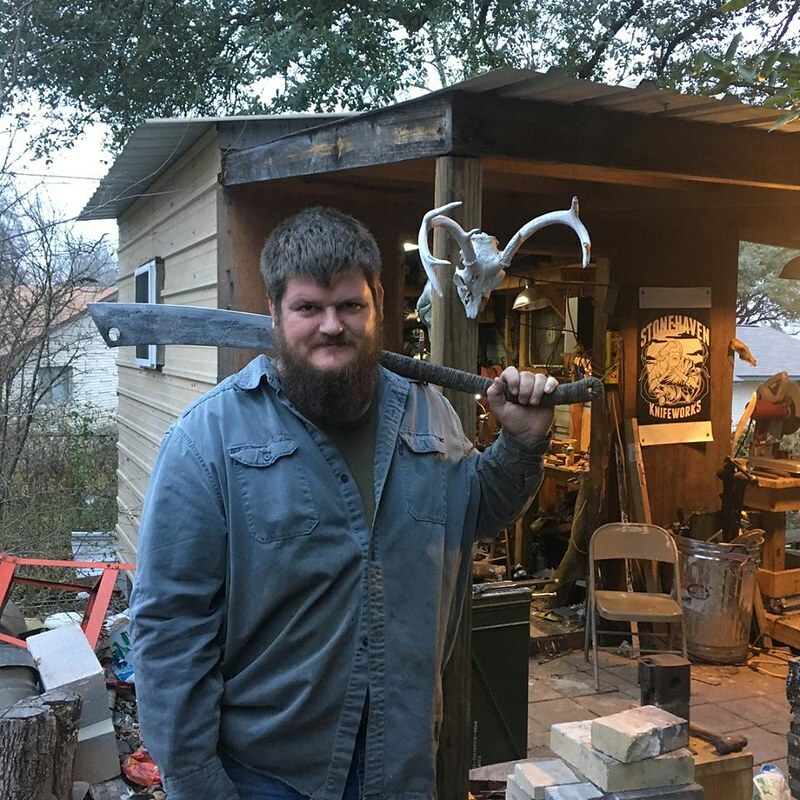 I just mailed off an interesting project: The biggest carcass splitter I've built to date. 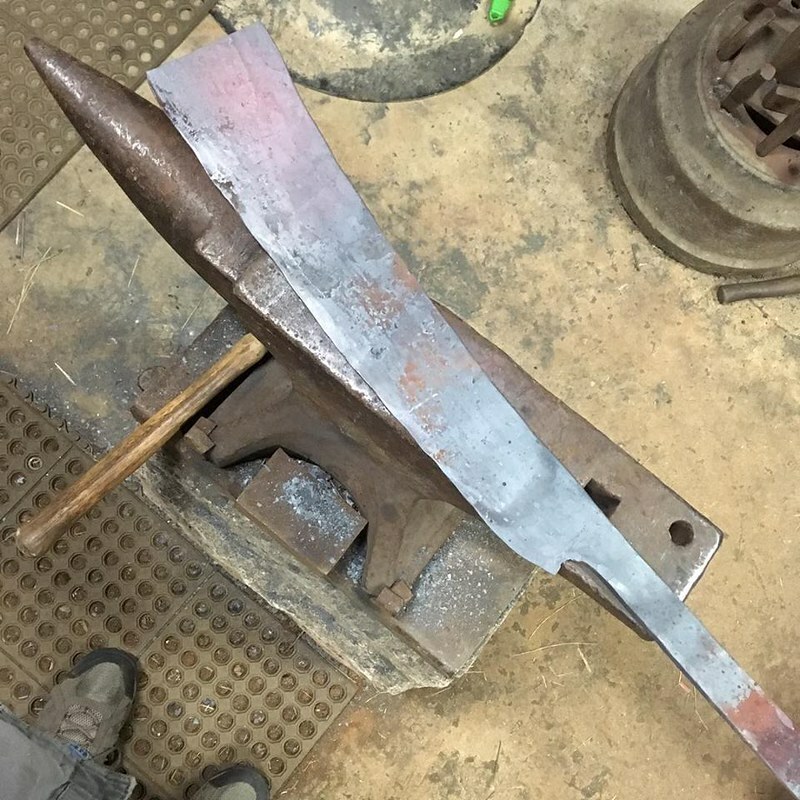 It was the widest and heaviest blade I've made (though not the longest), and I really want to make more. 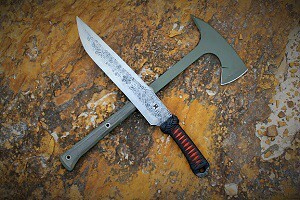 Probably will have one on my table at the Blade Show in June. The blade is 18" long by 3 1/2" wide, with an overall length of 40 1/2". 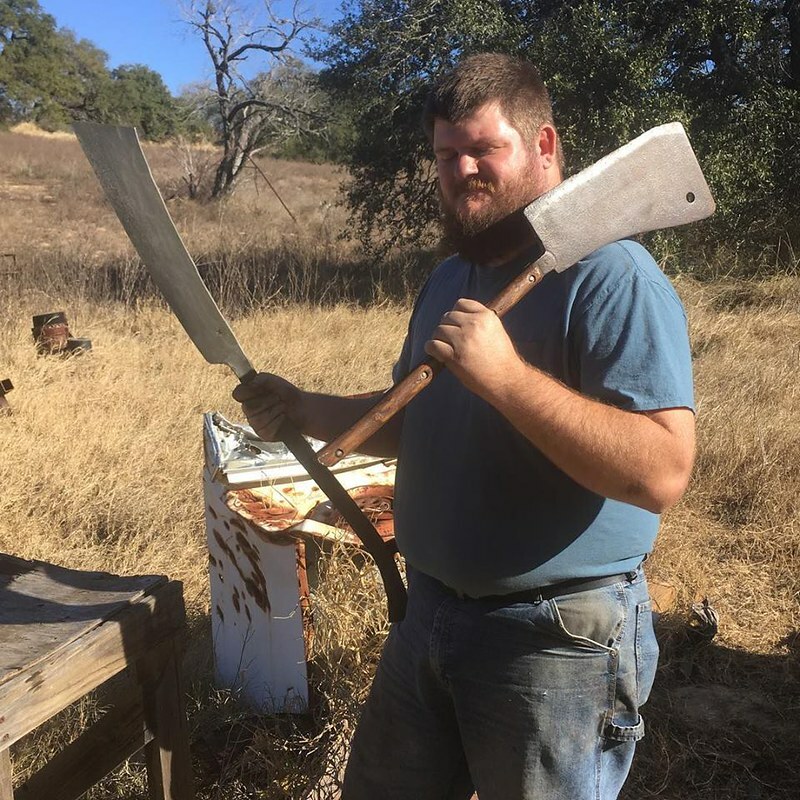 Its size made it difficult to take a picture that really showed the size and proportions correctly, but I got a few, and shot a video comparing it with an antique carcass splitter I was given by a customer. Here's the starting blank, cut from 1/4" x 3" 5160. 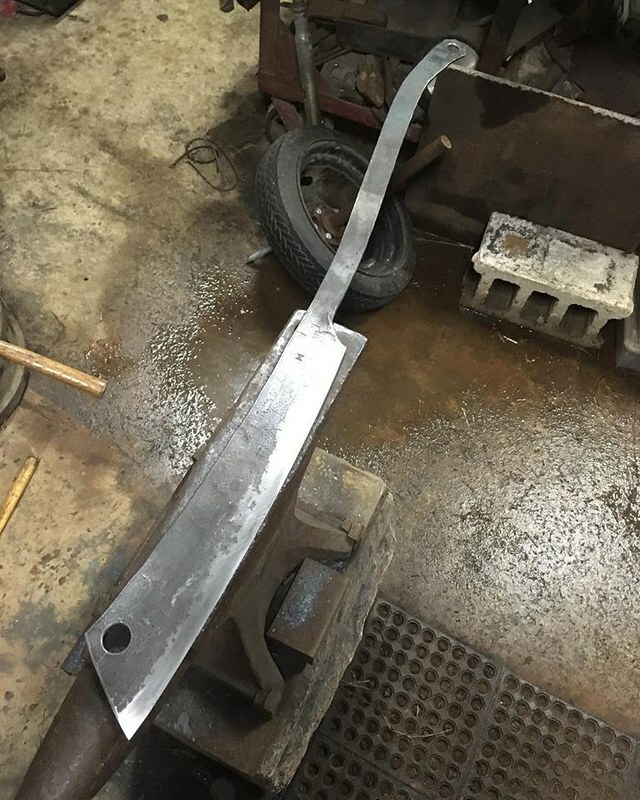 After forging out, the blade was about 4" at its widest, though after trimming the end to be aesthetically pleasing, it was 3 1/2". Comparison with the antique carcass splitter. Ready to heat treat. To give an idea of size, my anvil is 148 lbs, and the face is about 4" x 15". It was so large, I couldn't fit the whole thing into my kiln that I use to draw temper. I ended up holding the kiln lid open with firebricks, then filling in the gap with various bits of broken fire brick. If you look closely, the end of the tang is poking out between two bricks just under the little angled tab on the lid. 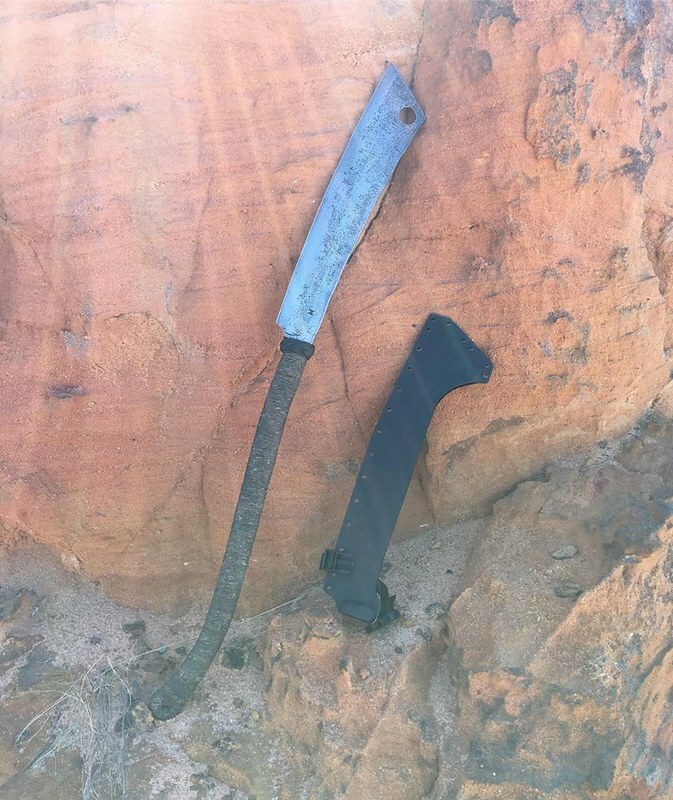 There is a better look at both carcass splitters, more details, more construction pics, wildly irresponsible swinging about of an 18" long razor-like blade, and general silliness in this video. That's the same kiln my wife has. She wants to know if you converted it to gas. 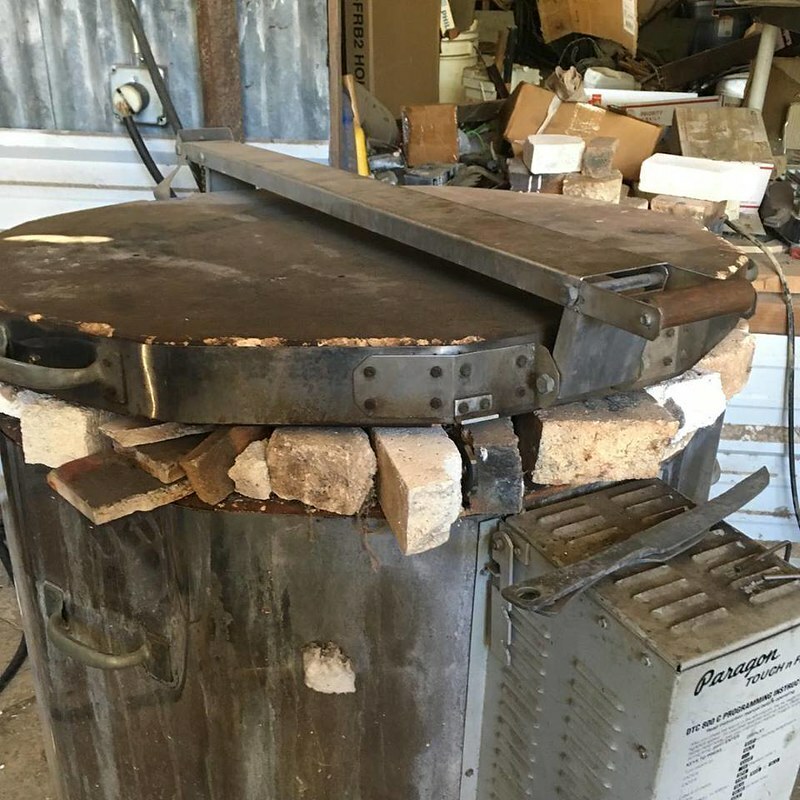 The Paragon is a three-phase kiln with a digital controller. I use it for tempering, meaning low temps. I got it for its large chamber, allowing me to easily fit in bush swords and tomahawks. Part of me wants a carcass splitter just for the heck of it, but the more practical side says "You have no real use for one." and that's the side that controls my wallet. So instead, I'll just look at the pictures of the carcass splitter Storm Crow made and dream. About all I can do right now anyway since I blew my gun and knife fund on Christmas gifts last year. 12_Gauge_Chimp wrote: Part of me wants a carcass splitter just for the heck of it, but the more practical side says "You have no real use for one." and that's the side that controls my wallet. It'll be awhile before I can get a carcass splitter or any other Storm Crow blade, but the time will come when I get one. It may be a few years, though. Not practical? What else you gonna split yer carcasses with? Seriously, I recently saw a video of one being used to break down the carcass of a hog that looked to be the size of a fully grown bull. 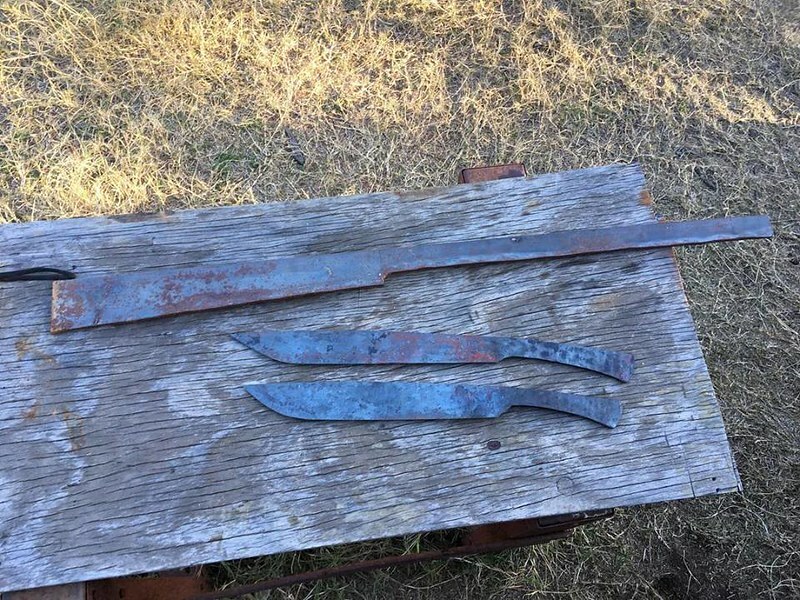 Got some steel in to make some more at some point in the future. At least by June for the Blade Show. Storm Crow wrote: Not practical? What else you gonna split yer carcasses with? Sadly, I have no carcasses to split, but I guess this gives me an excuse to get some friends together and go hog hunting. I'd love to start hunting hogs, but they are not this far North yet. Which is good and bad. I need to visit my ZS brethern in Texas someday and help thin the pest problem. Ok. Hogs are not this far North and West. But they are in the state below us.